Featuring scholars from Turkey and abroad on Saturday discussed growing discrimination and Islamophobia on the second day of an international conference in Istanbul. Ruling Justice and Development (AK) Party lawmaker Ravza Kavakci Kan said attacks like last month’s mosque shooting in New Zealand cause more tension in the society. “But by seeing that people of New Zealand came together and stood in solidarity (with victims) gives us hope as human beings in a world where there is increasing discrimination, increasing xenophobia and increasing Islamophobia which are linked together,” Kan said. 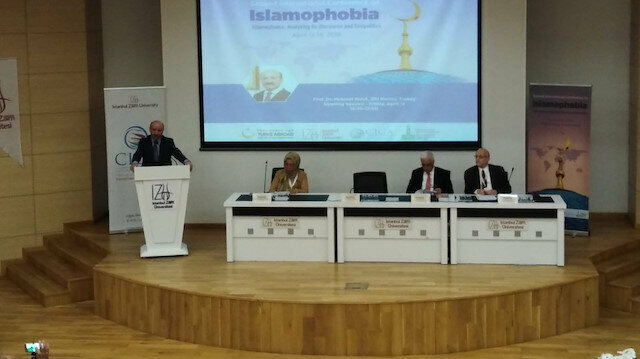 During the conference -- organized by the Center for Islam and Global Affairs (CIGA) at Istanbul Sabahattin Zaim University --, the participants also discussed the role of think tanks in promoting Islamophobia. Hafez said that the aim of such think tanks is to “legitimatize certain policies, which, this is I think and that is without any normative stance." “They get funds in order to support, to analyze the reality; and what we can observe when it comes to anti-Muslim agendas within certain think tanks they are following specific goals. They are offering expertise, offering advises to political actors," he added. In her presentation, Dalia Fahmy from Long University in the U.S. said that Islamophobia is referred to as dislike or prejudice against Islam or Muslims. “There is a dramatic increase in anti-Muslim violence that began in 2015 during the Republican regime,” Fahmy said. Usaama al-Azami of the Markfield Institute of Higher Education U.K. said that Arab autocracies were world’s “most powerful Islamophobes”. “[And] the geopolitical context of [such a phenomenon] is Arab spring,” he said in his presentation. “Islamophobia is not simply a form of cultural racism, it has roots in historical biological racism against the inferior other,” he said. Meanwhile, leader of United Voices of America, Ahmed Bedier said that Islamophobia is “more than just racism”.